Heroes of the Storm is a free-to-play online multiplayer online battle arena (MOBA) game from Blizzard Entertainment that was released on June 2, 2015 for Windows and Mac OS. Blizzard calls Heros of the Storm an "online team brawler" where two teams of 5 battle against each other over a variety of environments, controlling heroes from their library of popular video game franchises. All of your favorite heroes and villians from Diablo, StarCraft and WarCraft are here including Diablo Tyrael, Arthas and many more. Similar to other MOBA games such as League of Legends and Dota 2, the game has bits of action fighting games, real time strategy and some role playing game elements. The objective of each team is to be the first to destroy the other team's base using unique hero powers and minions. At the time of release there were a total of 37 heroes available in Heroes of the Storm but for new players only 5 to 7 are available for free. Assassins - Assassin heroes deal and extraordinary amount of damage to their enemies making them deadly on the battlefield, but players beware, they can deal more damage than they can take making them vulnerable, especially to the heavy warrior heroes. Warriors - Warrior heroes are the brutes of heroes of the Storm they excel in melee based combat and have ability absorb huge amounts of damage while dishing it right back out. Support - Support heroes provide just that, support for the team in the form of healing and special abilities that can help sway the battle in favor of their team. Specialists - The Specialist class of heroes include siege and commander heroes which offer a wide array of abilities and advantages to help the team in battle. One aspect that makes Heroes of the Storm a little different than other MOBA games is the emphasis Blizzard tries to place on teamwork. 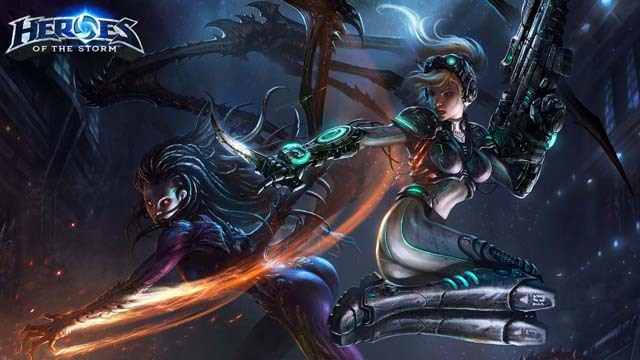 In games like League of Legends or Dota 2, players advance their heroes independantly. This can lead to some teammates lagging behind others creating a point of weakness on the team. In Heroes of the Storm all heroes advance levels and gain new abilities at the same time and eliminates the element where one hero could drag a team down due to lack of advancement. Heroes of the Storm also features a variety of battleground maps (seven at time of release), where each battleground has a different layout, theme and set of objectives that must be completed for a team to win. For example, In "Tomb of the Spider Queen" battleground players try to gather gems, dropped by minions and heroes after they die, drop them at the alter of the Spider Queen to unleaseh Webweavers which deal damage to opposing team's defenses. Objectives for the other battlegrounds are a slight variation of the above, but the differences offer a nice variety of strategy and game play not found in many other MOBAs. Game modes offer another level of variety in Heroes of the Storm, there are total of seven different game modes including Tuturial, Training, Quick Match, Hero League, Team League and Custom Games. Some of these modes are draft based where both the player's hero and the battleground are chosen at random. Other modes are non-draft based and give players the abiliby to select their hero knowing what battleground will be played. The game also includes a matchmaking system which uses a hidden formula to match teams and players of similar abilities. Heroes of the Storm is supported, updated and patched on a regular basis, major patches typically introduce tweaks to game play and hero balance as well as new content. Below is a list of some of the patches released and details on what has been fixed or changed. Heroes of the Storm PTR Patch - March 21, 2016. This patch was released to the public test realm (PTR) and will go through testing through before being released to everyone. Full details can be found in the official Heroes of the Storm patch notes but some highlights include a new battleground titled "Lost Cavern", a new hero called Dehaka and number of other minor changes to the UI, art, bug fixes and more. Heroes of the Storm is completely free to download, install and play through Blizzard's Battle.net game portal. Like many other MOBAs it does feature micro-transactions using real money which allows players to purchase access to heroes and alterations to in-game visual appearance, but does not provide any game play advantages over players who choose to not to spend any money.